Dean Winnard will join Morecambe on a two-year deal when his Accrington contract expires at the end of the month. Morecambe have made Accrington Stanley defender Dean Winnard their first summer signing. The 26-year-old will join The Shrimps on a two-year deal when his contract at the Crown Ground comes to an end at the end of the month. The experienced defender, who can play at left back or in the centre of defence, made 283 appearances for Accrington after joining them from Blackburn Rovers in 2009 and has turned down a new deal with John Coleman’s side to move to the Globe Arena. Last season he made 16 appearances as Stanley reached the League 2 play-offs in what turned out to be an injury-hit campaign. Shrimps’ manager Jim Bentley says Winnard is a “winner” who will be a great addition to his squad for next season. Bentley said: “I have seen a lot of Dean over the years and I have always admired him. “I have been looking at people who will strengthen our back four and I am sure Dean will do that. “He has a great deal of experience at this level and is a winner. “He can play at centre half or at full back and ticks all the right boxes for us. Winnard will bring much-needed experience to a Shrimps defence that shipped 91 goals in League 2 last season. It led to a complete reshuffle at the back with Ryan Edwards the only out of contract defender offered a new deal. Wigan-born Winnard becomes the 11th player under contract for next season at the Globe Arena as Bentley undertakes the biggest summer rebuild of his five years in charge. 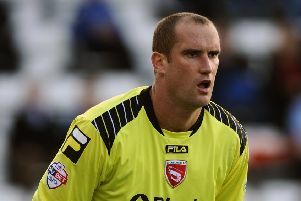 Elsewhere, one player staying at Accrington is former Shrimps skipper Mark Hughes. The central defender has signed a new one-year deal with the option of another after impressing at the heart of the Stanley defence .